Clarksville, TN – The perfect crime. No witnesses, no evidence, no clues. Only a single pair of gold wire rim glasses holds the key to solving the murder of the century. The chilling true story of the legendary duo who committed one of the most infamous and heinous crimes of the twentieth century unfolds in musical form upon the stage of the Roxy Regional Theatre‘s theotherspace in “Thrill Me”: The Leopold & Loeb Story, playing four evenings only, May 2nd – May 10th. “Thrill Me” at the Roxy Regional Theatre stars (Top) Ryan Bowie and Michael C. Brown. Directed by John McDonald and featuring Tom Thayer on piano, Stephen Dolginoff’s two-character musical drama focuses on the obsessive relationship between soon-to-be law students Nathan Leopold, played by Ryan Bowie, and Richard Loeb, played by Michael C. Brown. Told in flashbacks beginning with a 1958 parole hearing, “Thrill Me” reveals the series of events in 1924 Chicago which drove these two brilliant, wealthy 19-year-old gay men to commit a senseless thrill killing which scandalized the nation. 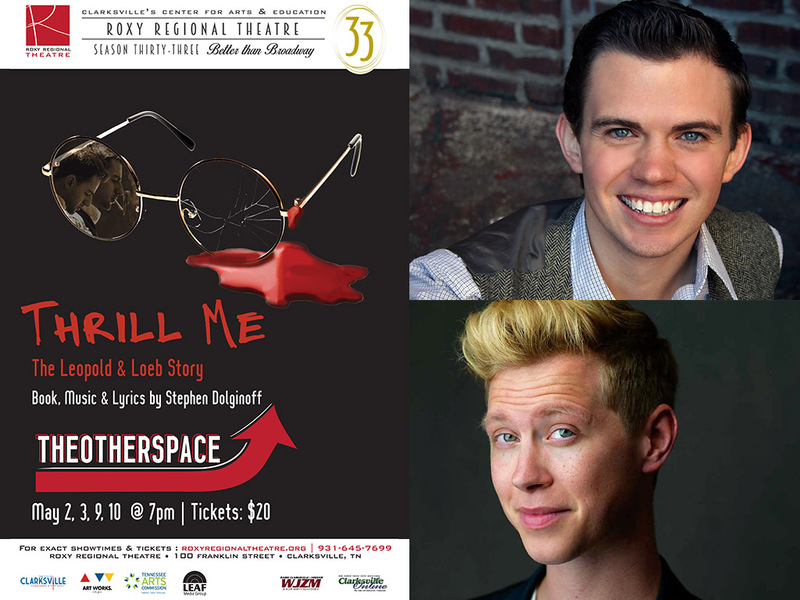 “Thrill Me”: The Leopold & Loeb Story is presented in theotherspace, the 50-seat black-box theatre located upstairs at the Roxy, and plays at 7:00pm on May 2nd, 3rd, 9th and 10th. Due to language and content, this production is recommended for mature audiences only. Tickets are $20.00 and may be purchased online at www.roxyregionaltheatre.org, by phone at 931.645.7699, or at the theatre during regular box office hours (9:00am to 2:00pm, Monday through Friday, and one hour prior to curtain).